Singkarak is a minimalist and clean WordPress personal blogging theme. The theme is fully-responsive from top to bottom ensuring you get the best benefit from desktop computer to small screen mobil devices. This blog theme comes with a lot of features such as unlimited colors, support WordPress post format (Standard, Gallery Slideshow, Gallery Grid, Link, Image, Quote, Audio, Video), tons of shortcodes, and a powerful unbranded theme options. 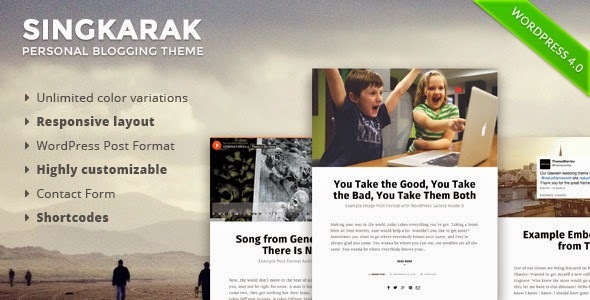 Item Reviewed: Singkarak Responsive WordPress Blog Theme 9 out of 10 based on 10 ratings. 9 user reviews.